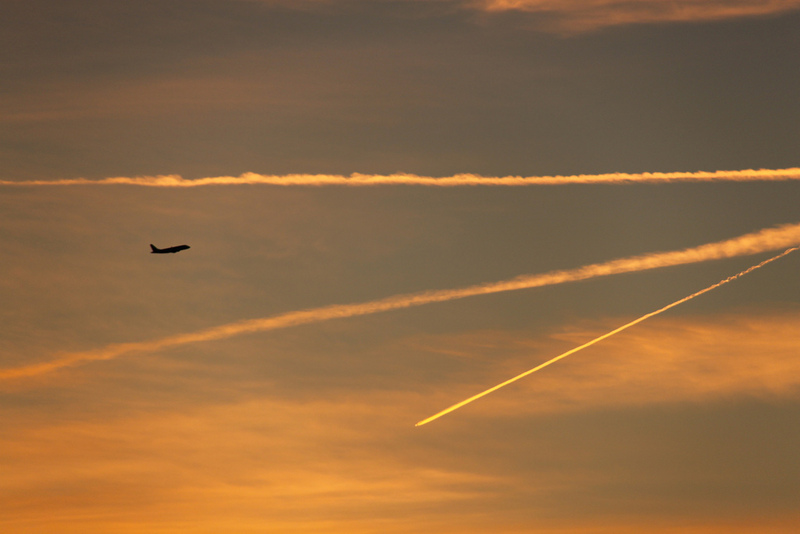 A jetliner streams the sky with its destination marks. Speed accompanies flight. My eyes scan the brief moments its course occupies my view and silently I wish I were on board, a passenger heading somewhere. Repeatedly are my thoughts on such whims whenever I spy a plane in motion. Call it the travel bug in me. Call it the adventurous spirit birthed inside. Whatever the base, a smile crosses my lips every time I see the possibility of new experiences. New exploration. And then there are times I have to check my heart: do you just mean to flee? I catch myself hoping for something temporary. For change. Merely for the sake of different. And conviction sets in and I see how tragic it is that I place my strive on change, when my hope should solidify in eternal. Every vibration, every ripple of movement is a reason for rejoicing. Pleasant or unpleasant, each experience is an opportunity for generous gain. For a reason to be better. I don’t have to wait for a new moment or a new trek. Naming beauty truly is a catalyst for change in life’s perspective. I don’t want to leave. I didn’t want to leave my previous home. Even when I really wanted to. Even though at the end it could be, at times, excruciating to exist in the spaces that had been marked. The restrictions that had been laid. By others. By myself. The glorious freedom came when I placed miles between the lives. The miracle came when I looked back at where I called my home for three years and only saw the lovely. Only focused on the joy. The hilarity. The experiences that changed me for the better. When the dark passes away and the hurts fade behind and the remnants are enrichment, benefit, connection, community, and more lessons on love than imaginable…that is the moment Truth wins. That is the moment He paid for. Even He wanted to be anywhere else. One night in that garden. Begging for a new tomorrow. But there was something He wanted more. It was that very desire that saved my life. That saves it every day. So while I don’t think I’ll stop wishing on planes more than on stars, and while I don’t really think that’s a wrong ideal, I will wish for the right reasons. For the journeyman indwelling, created from Spirit and chromosome, constructed by a Master Craftsman. I’ll want more than my own hopes. Sweet Dolly, oh how good to see your words. Thank you for coming here and encouraging me with your heart. I'm doing well – being stretched all the time. Constantly learning. Seeking for humility and selflessness. Failing every day. But finding Grace and sheepishly coming home. Hugs to you too friend! Please share how you are doing.